There are a lot of trainers out there, but they are not all created equally. There are no requirements for being a dog trainer. Anyone can hang a shingle and say that they’re a trainer. How do you know if your trainer is right for you? How do you know that they’re any good? You have the right to ask them questions (and you should). A great place to start is the trainer’s education and background. Certifications and/or degrees don’t guarantee a good trainer, but it does show that the trainer is taking their profession seriously. The same is true of belonging to professional organizations and attending continuing education events and trade shows. Professional organizations also generally have standards and may have their own certifications. What certifications and/or degrees do you hold? Do you belong to a professional training organization? If no, why not? When is the last time that you attended a dog training trade show? 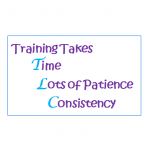 When is the last times that you attended continuing education for dog trainers? What did you learn from attending your last event? If the trainer belongs to a professional organization, you can go to the organization’s website and check their list of trainers for verification. Trainers should be able to discuss their philosophy with you. First, though, consider how you think that your dog should be treated. Is coercion okay (forcing the dog to sit or lay down)? Are prong collars and shock collars okay? Would you rather treat your dog more gently? Is yelling ok? What kind of yelling is ok? It can range from a firm “no!” to towering over your dog and yelling for an extended period of time. This isn’t about judgement. Find your comfort zone, and then stick to it. 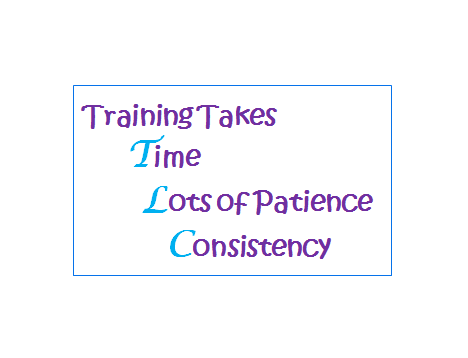 There is a whole continuum of philosophies about training, but let’s start at the extreme ends. On the one end, are the trainers who use prong collars, choke chains and shock collars as first options. This equipment is designed to inflict discomfort, if not outright pain. These trainers may force dogs into a sit by pushing on their rump and then force the dog into the down position by pushing on their shoulders. At the other end of the continuum are those who believe that only positive training is okay. They don’t believe that you should ever raise your voice or use any of the equipment above. The dog is never forced to perform any behavior. Most trainers are somewhere in the middle. Again, decide where your comfort zone is and stick to it. What do you do if the dog doesn’t respond? What if the dog still doesn’t respond after you’ve tried that? What collars, leashes, harnesses do you use regularly? The trainer shows you how to teach the dog to roll over. The dog has been taught “sit” and “down” by being jerked and/or pushed into a sit and into laying down. When the dog figures out that the trainer will be “teaching” him something, he walks slowly over to the trainer with his tail between his legs, his body lowered and his ears down. He is forced to lay down and physically rolled over. Now consider the same scenario taught differently. The dog has been lured into sits and downs with treats and also rewarded with excited praise when he is correct. When he is not correct, the trainer turns her back, taking the treat with her. The trainer gets her treats and calls the dog to learn to roll over, the dog bounds over to her and is jumping around (not on) her. He is confused about this new trick, so he begins to sit and down and do any other tricks he knows that have resulted in praise and treats in the past. Some trainers have been in the business a very long time and haven’t kept up with changing practices. Some have been taught by the people who haven’t kept up to date. Unfortunately, those methods often work and quickly. For some, that is enough reason to continue to use them. One of the biggest problems with the harsher methods (other than the fact that it’s harsh) is the fear and anxiety that it creates in the dog. Some dogs will cower and “take it,” but many dogs lash out at some point which means that they end up attacking someone. They are protecting themselves, but they will be blamed for the behavior created from being treated roughly. Next consider what you need to accomplish. Do you want your dog to have basic manners? Do you need help with more serious issues, like your dog bit someone? Let the trainer know the whole truth about the situation. Do you want the whole family to be involved? For example, some trainers don’t want to work with a dog who bites. Some trainers only work with dogs who bite. Some trainers work with younger clients, some don’t. Does the trainer have a special focus or preference? It’s important to find a trainer that is willing to work with you and meet your needs and your dog’s needs. Have you ever worked with a dog that _(fill in the behavior that you need to work on)_? Do you have any specialty areas? If yes what are they? Do you work with dogs that aren’t in your area of specialization? What is your experience in working with dogs in that/those area(s)? What kind of classes do they offer? Private? Group? Special classes? Do they work with children/whole families? Brynn’s Critters starts with the least intrusive style of training. If it can be done relatively easily on a regular collar and leash, in a positive manner why start with anything more harsh? We believe that dogs that think that training is fun will be more likely to want to work for you and with you. Dogs also need clear messages about what is “right” and what is “wrong.” Are they on the right track? If yes, reward the progress with enthusiasm and a reward! If no, let them know. Often saying “eh-eh,” turning your back and taking the treat with you is enough to result in a new behavior. But saying “no” or “eh-eh” with the same voice that you praise with is confusing for the dog. We vary our tones to make our desires more clear. As far as equipment, we start with regular collars and leashes and evaluate from there. Preferred equipment also includes no-pull harnesses and head collars. We take the use of harsher equipment seriously and only discuss harsher equipment rarely and only if absolutely necessary. Our goal is that you can put on a leash and walk your dog! Remember to have fun with your pup!